Thus, what I am trying to achieve is for the current cell to take the value of the cell directly below value and repeat, skipping each of the directly below cells. Then, selecting that row and the row below, which doesn't have any formulae, and dragging down. But, sadly unless I only drag down one then reselect it doesn't work correctly. 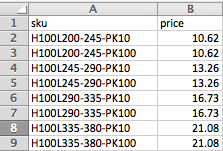 It seems to take the first selected cells value and then adds 1. So, if I'm understanding correctly, in row 2 you want the value from row 3, in row 3 you want to keep its own value, in row 4 you want the value from row 5...etc? If that's correct, there's a fairly straightforward process you can use - in C2, enter the formula =$B3. In C3, enter the same formula, =$B3. That should put the same value into both cells. Then highlight both cells and use the fill handle to copy them into the other cells. This should get you the repeating pattern you want. The if checks to see if needs to go down 1 or just go across. Row() returns the row this is on. In the case of B2 it is 2 Even() checks if something is even. For a 2 this is true. IF (test,True_Action,False_Action) . The if works by making a test then choosing either a true or a false action. Since Even is true for b2, the true_action points to C3. Note. This has the side effect of expanding your data range. A copy /paste special could be used over the b row to replace with the new values. Then afterwards, the C column could be deleted. How can I get the hex value of an 8 row column with depending on background color?